and socialites in Nigeria,mostly because they work closely with most Nigerian celebrities. These celebrity makeup artists are booked for their services and they make a lot of money from their work. Most often they get their customers and clients from Instagram and Facebook also a few of them are Youtubers and Bloggers. Nigerian celebrity makeup artists are now tapping from the global US$170 billion dollar makeup industry. 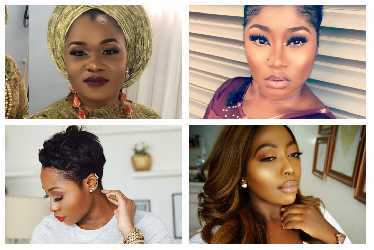 You don't have to be a celebrity before you can get a face beat from a celebrity makeup artist,in fact most of these socialite make up artists also have makeup shops in Port harcourt,Lagos and Abuja. In this post we have decided to select some of the top 10 best celebrity makeup artist in Nigeria this year. Banke Meshida Lawal is one of the top celebrity make up artist in Nigeria with over 400 thousands followers on Instagram. Her clients include high ranking politicians,artistes, actresses,musicians Etc. She posts makeup pictures of her clients and also tutorial videos. She is one of the best celebrity makeup artist in Nigeria. Holding it down at the 2nd spot is Fati Mamza,her make up brand is called Mamza beauty,she is popular on Instagram with over 170 thousand followers. She has many cients in Abuja where she is based,according to sources she has been practicing makeup since 2008 and is ranked as one of the top celebrity makeup artist in Nigeria. She also organize make up workshops. Ifeoma Adefemi is a mechanical engineer that is a professional make-up artist in Nigeria with over 170 thousand followers on Instagram. Her makeup brand is called Iposh looks,she is ranked as one of the youngest creative makeup artists in Nigeria. Actually is not often that you see talented male makeup artists excelling in the female dominated world of makeup,but thats not the case for Jide who is ranked among the top makup artists in Nigeria with over 140 thousand followers on Instagram. Chinalurum Ogbonna is a first class celebrity make up artist in Nigeria. The artist who bagged a first class dumped her degree to become one of the sought after celebrity make up artist in Ghana after studying in the West African country. The Abia state Nigerian born makeup artist has a long list of Ghanaian celebrities as her clients such as Jackie Appiah,Yvonne Okoro,Efya,Sakordie,former Ghana first lady Nana konadu Agyeman Etc and also her Nigerian celebrity clients include Ebube Nwagbo,Korede Bello,Ice Prince Zamani Etc. She has over 100 thousand followers on Instagram,in 2016 she won the Best celebrity makeup artist 2016 Ghana Makeup Awards,she calls her make up brand ''Nancy Blaq''. Bahijjah Bawa is holding it down for the northern folks that have a thing for makeup. The malaysian trained makeup artist's brand name is called 'Make Up By Beejay',some of her services include makeup training, salon, pedicure, semi permanent eyelashes Etc. With over 120 thousand followers on Instagram,the graduate of business information system is one of the sought after makeup artist in Kano State Nigeria. Elaine Shobanjo is also one of the popular makeup artist in Nigeria with over 72 thousand followers on Instagram. She also has a make-up studio/Salon located at Lekki Lagos. Anita Brows refers to herself as a make up surgeon and beauty educator,the makeup artist whose full name is Anita Brows Adetoye is also popular among make up lovers in Nigeria. She regularly educates and gives makup tips to over 70 thousand Instagram fans that follow her. Tenny is another top celebrity make up artist in Nigeria,she is the founder of Beauty by Coco which is her own makeup brand,she has also worked with a couple of Nigerian celebrities. She has over 60 thousand followers on Instagram and holds her own makeup class. artist in Nigeria with over 60 thousand followers which are mostly young Nigerian makeup enthusiasts. She also has a blog where she shares her experiences and uploads tutorials and videos. Chidinmma is also a Youtuber and content creator.